Courier News - Dundee story ARCHIE Spring Ball. CR0007113 Picture shows; the organising committee at the ARCHIE Spring Ball, at the Invercarse Hotel in Dundee tonight, with Cassie Thompson - Director of Partnerships at ARCHIE 3rd from right, Sarah Johnston - Fundraising Manager ARCHIE 2nd from right, Ian Philp - Chairman of the Fundraising Committee back right, and guest speaker Andy Cameron (in front of Ian Philip). Friday 15th March 2019. Dougie Nicolson / DCT Media. Charity fundraisers have collected more than £38,000 to help boost facilities at the NHS Tayside Children’s Hospital. 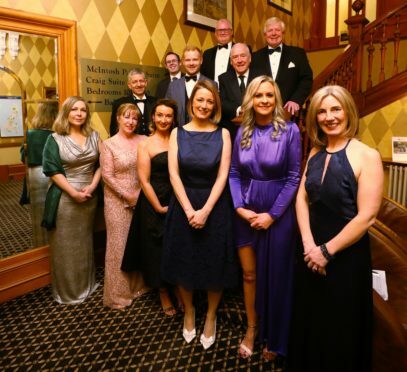 The ARCHIE Foundation hosted its second Spring Ball last weekend which attracted hundreds of guests. Thanks to a raffle and auction the event raised £38,831.50 for the facility based at Ninewells Hospital, in Dundee. The funds will go towards helping the charity reach its £2 million target to pay for a twin operating suite for the children’s hospital. Over the years The ARCHIE Foundation has paid for specialist equipment, helped train staff, buy toys, fund research and provide specialist staff. Ian Philp, chairman of the charity’s Tayside fundraising committee, said: “The evening was absolutely superb. Staff at Gillies, in Broughty Ferry, won the star lot at an auction when they paid £15,000 for Signpost Wullie – one of the sculptures set to feature on the upcoming Oor Wullie’s BIG Bucket Trail. The statue has a post pointing to Aberdeen, Edinburgh, Inverness and Glasgow, the other cities taking part in Scotland’s first nationwide public art trail. A location for the signpost has still to be decided upon but the trail runs for 11 weeks from June 17. The charity ball was held at the Invercarse Hotel, in Dundee, last Friday. The guests were also entertained by the Sing It Sign It: Makaton Choir at the event. Scottish entertainer Andy Cameron also performed along with the Dundee-based band Eat The Peach. Sarah Johnston, fundraising manager for The ARCHIE Foundation in Tayside, added: “I’d like to thank the Tayside fundraising committee for organising such a great event. “It’s also great to see the business community digging deep to help raise vital funds for sick children in Tayside.